Humans are communicative and collaborative by nature; we naturally have the urge to communicate information and collaborate with others for resolving problems. We can call this initiation of communication for collaboration as "meeting" aimed for proper planning and execution. Meeting together as a group or as a team is quite common in the modern world as well, but many people are afraid of meetings and stay away or contribute less towards the goals. Why this type of behavior happens in such a safely established office environment, what could go wrong within the organization's meetings? What is your organization's meeting culture? 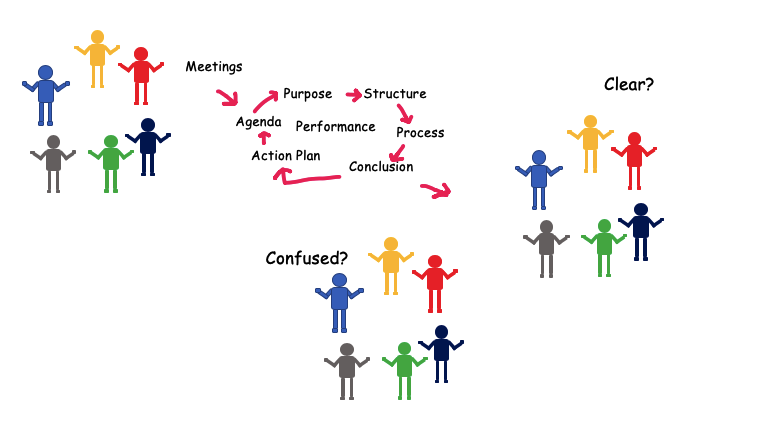 Do your meetings end with a clarity and action plan or confusion with partial commitment? Let's explore this topic in general and specific. Modern organizations drive their meetings by quick decision-making approach for faster time-to-market. Quality is part of these meeting processes for ensuring timely decision-making on what is important and urgent, and doing the right thing at the right time. Centralized decision-making takes a holistic approach and talks about topics or decisions that affect the entire organization scope and influenced by standards, compliance, long-term commitment, strategy, specialized skills, and tactics. 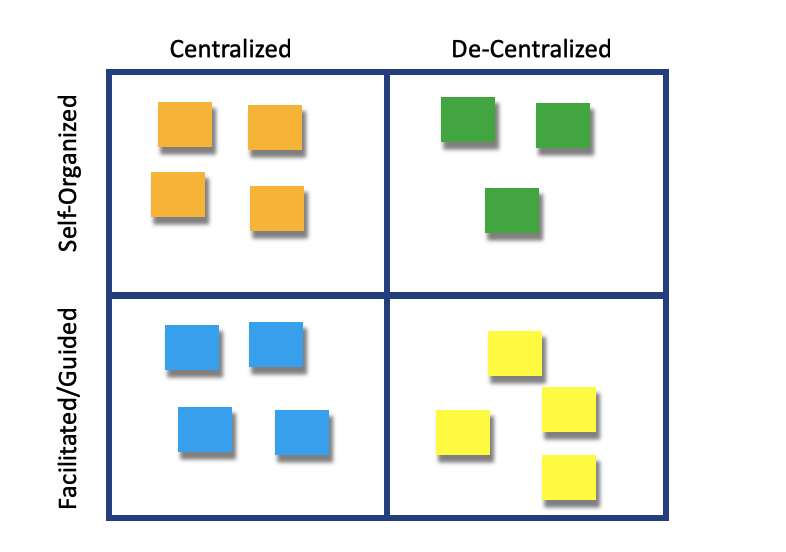 De-centralized decision-making takes a local context connected to big-picture and holistic approach for making local decisions by the teams (e.g., for building software/hardware/firmware features) themselves for faster processing favoring organization agility. Q) How Manufacturing and Software Industries tackle Meeting challenges? Lean Manufacturing makes local decisions (de-centralized decision making) possible by specific procedures like "Andon" cords - The Toyota Production System - designed to solve the "stage" issues and "end-to-end" production flow quality issues. The Software Industry also makes local decisions possible, and has changed some of their collaboration meetings entirely (after the Agile Manifesto 2001), based on the Agile movement recommendations that suggests local context decisions related to team should be made by the Team(s) themselves through a pull-based approach like "Lean" and also only focusing on the current and next iterations guided by vision and roadmap. The Lean-Agile practices influence an organization transformation with ceremonies that are mainly facilitated and encourage a self-organized approach and local context based decisions. 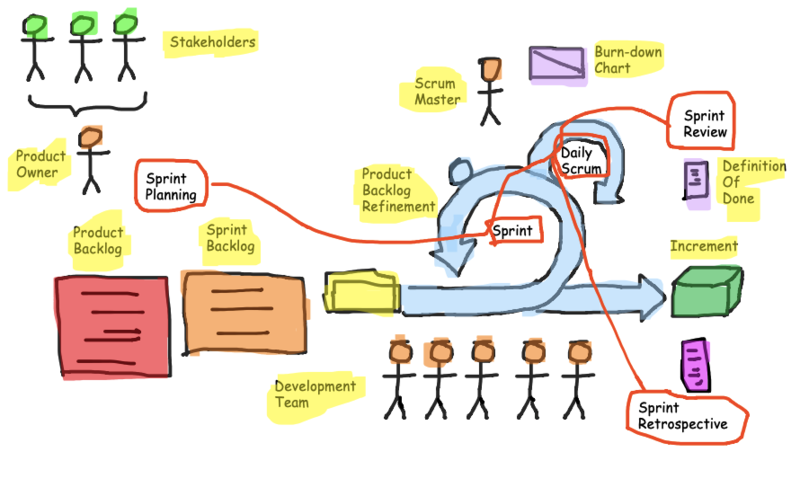 Some of the Agile practices utilize Open-Space meetings, Framework like Scrum uses - Sprint Review & Sprint Retrospective ceremonies to know about the product, process and people level progress and improvements. 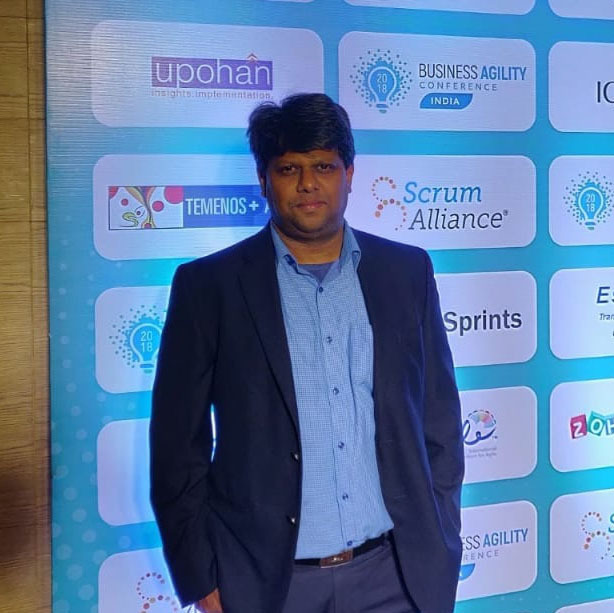 Agile Practices and Lean Thinking has similar - small batches - approach when it comes to categorizing the centralized and decentralized decision-making for agility, employee empowerment and creating a sense of psychological safety based work culture. What are the challenges in establishing a good meeting culture? 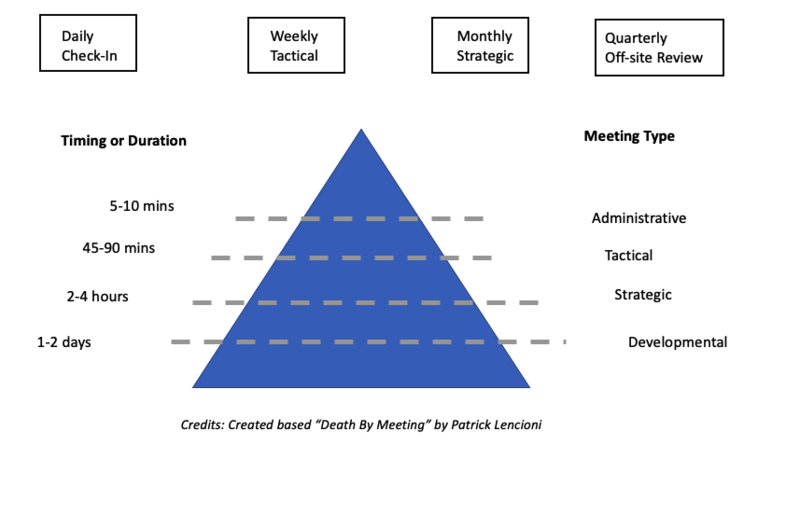 The main problem we see usually is, If we still apply inappropriate style for a meeting type, like the traditional command-and-control style for decentralized decision-making context, then we notice people tend to avoid the meetings and participate less over a period, creating a low-performance or non-performance as a system. Also, Depending on the meeting's intent, if the meetings don't have follow-up or sync meetings, the agenda, action plan, execution, and outcome will not be in alignment with the big picture and vision. There will be a lack of shared understanding, trust and commitment issues. For example, You can see the following two types of meetings, 1) facilitated meetings - where individuals and interactions are crucial and 2) command-and-control based meetings - where authority is essential. 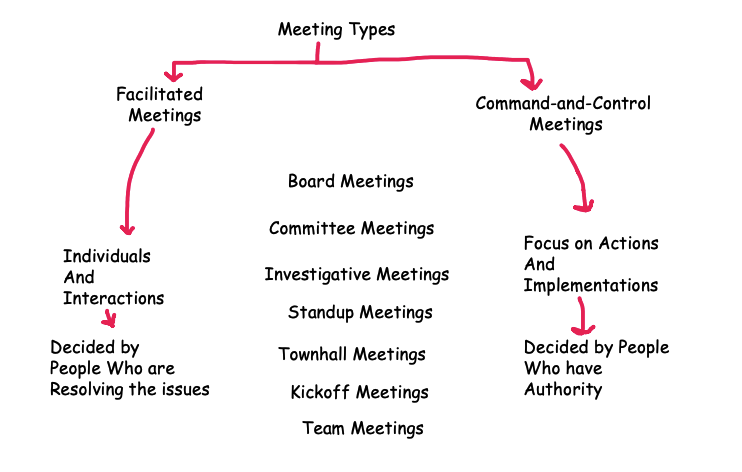 Considering the meeting type according to the decision type is critical. 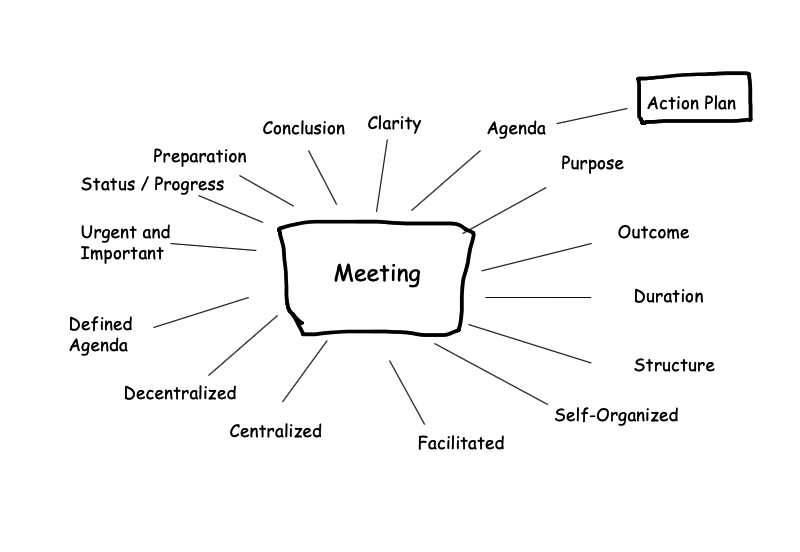 Usually, the decentralized decision-making goes well with facilitated meeting type. You can sort the above meeting types (as an exercise) and see which meeting type belongs to which meeting category and also internally for your meetings you can do a similar exercise. The meetings over the last decade have seen a gradual evolution regarding visibility, transparency and inspect & adapt approach for their meetings. Lean-Agile mindset associated with Systems thinking has greatly influenced the way we run meetings by categorizing the meetings and encouraging full participation and collaboration. Good Facilitators, help and support the participants to achieve clarity at the end of the meeting, a team consensus, prepare an action plan, follow-up and sync meetings before next milestone meetup. The Teams themselves update progress, create visibility and transparency in the planning and execution and share the data for retrospectives. 1) Death By Meetings by Patrick Lencioni - The work of Patrick Lencioni provides guidance on objective, meeting type, duration and utilizing this type of guidance helps us to focus and achieve clarity. 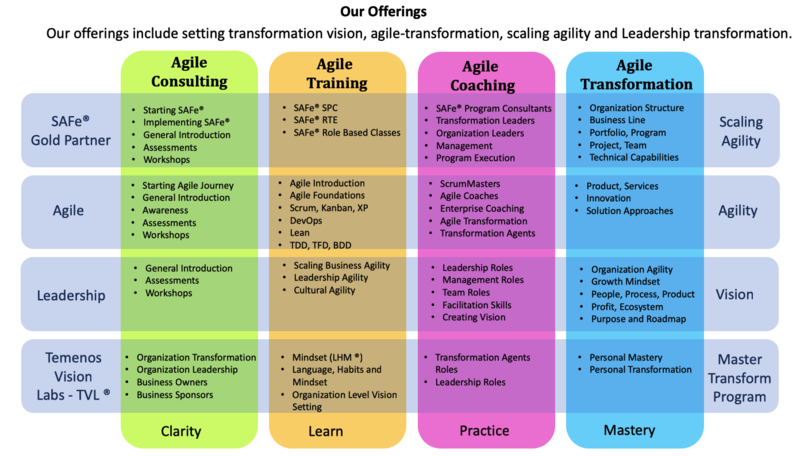 2) SAFe® Scaled Agile Framework - provides simplified, implementable and customizable framework for the necessary guidance for scaling Lean-Agile mindset with Systems thinking. The SAFe® meetings help to get a shared vision, shared commitment, alignment, and recovery. Especially the Program Increment planning is a facilitated two-day meeting event, where the stakeholders, business owners, value stream members, facilitators work together to identify the risks and realistic plan for establishing goals for the Program Increment duration/roadmap. 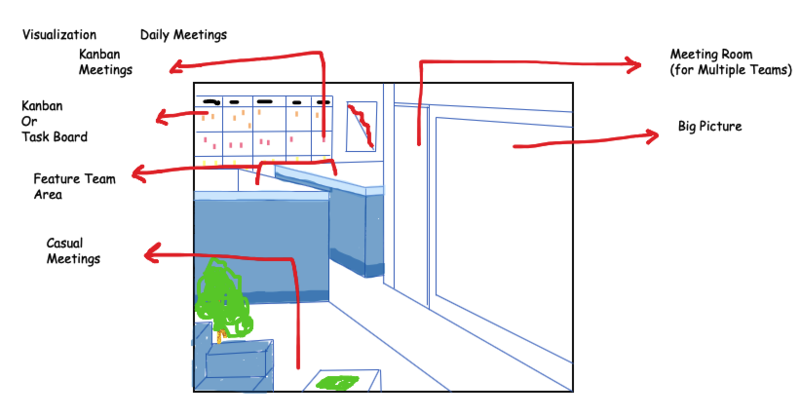 3) Kanban Meetings - Kanban is a visualization approach taken from the "Toyota Production System" and utilized as a signal card and as a system to reflect the exact progress, bottle-neck analysis of the flow. The culture of the organization is either serious about issue-resolution or gets into a blame-game culture. The productive meetings are the ones that have good issue-resolution history and approach to create innovative solutions for future growth. They welcome the new joiners of the organization with a positive mindset and participative work culture. The following are the common elements of a meeting; a good understanding of the elements will make our meetings successful and valuable for the organization. Good meetings are formed by continuous reflection for improvement. Getting the meeting participants to look at the decision-making styles and running retrospectives on the issues can create a good collaboration from the participants. 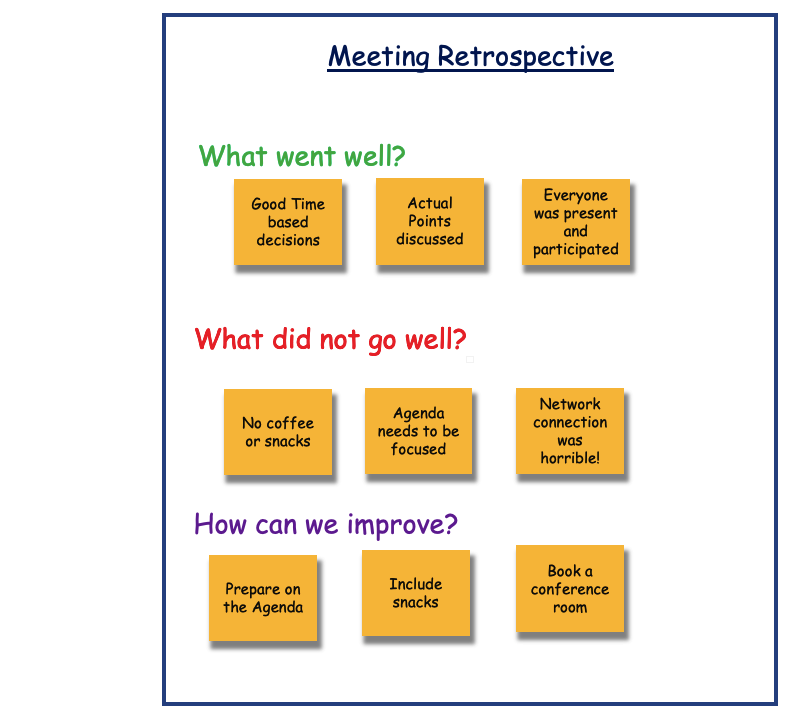 It is important to conduct Meeting retrospectives for every meeting quickly at the end of the meeting itself or regularly. It is better to encourage face-to-face culture feedback and avoid opinions and hidden agenda, to create a better understanding and bonding between the participants and the facilitators/stakeholders. A good positive and committed meeting culture is critical for organizational decision-making, progress, and growth. The meeting culture also provides positive feedback for the employees that their inputs are considered, empowered for deciding themselves where required and create a psychologically safe and satisfying work environment. Emphasize on a continuous improvement meeting culture through self-organized approach for your teams and team-of-teams. Imagine that you have work with a geographically distributed team in different time-zones, cultures and language barriers - who need to work together for delivering mission-critical software/product/services and how to address this large-scale collaboration and large audience? One such right approach is SAFe® PI (Program Increment) Planning which helps by preparing and guiding large-scale planning and execution with feedback loops, inspect & adapt, progress demos (system demo) with a built-quality approach. SAFe® is one of the leading Scaling Agile Frameworks which provides a good preparation, execution approach with cadence and synchronization to stay on track with your organization's mission-critical goals. 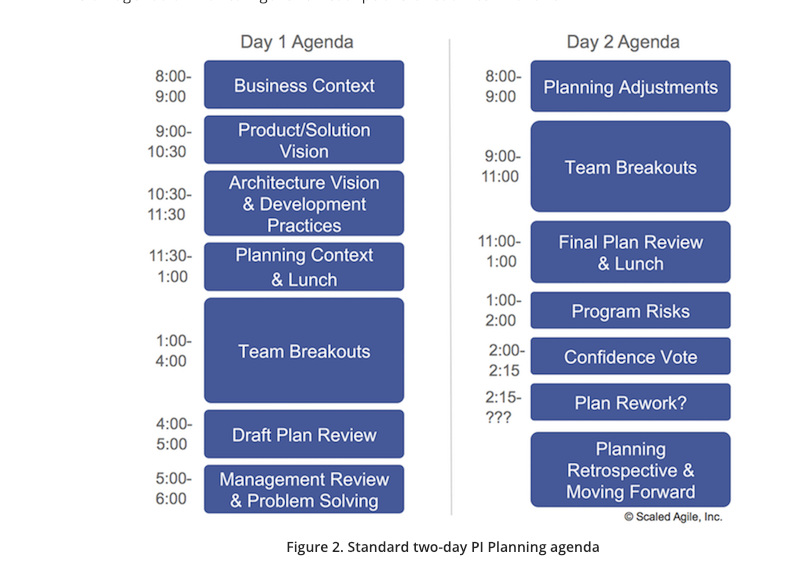 The Program Increment Planning for Program-Execution is a two-day meeting event for all who are delivering value (i.e., the people in the value-stream) is invited to participate, plan, learn and share the upcoming risks and mitigate then commit to a flexible plan for their execution. If you are an organization leader or manager or transformation agent who is willing to change the meeting culture, we can help by providing the required assessment, training, and coaching, thinking tools to improve the individual focus to a compelling shared vision and then make the right decisions by self-organizing work culture. 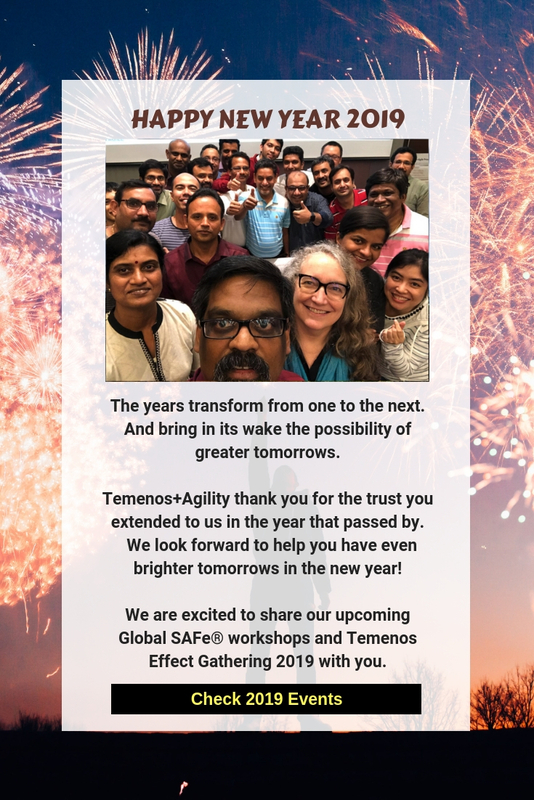 For SAFe® related training & events, please visit the Temenos + Agility events page. We Temenos + Agility is an SPCT Gold Partner with SAFe®. Now that we have seen how much of a game-changer personal vision could be in delivering digital or software products, the question arises as to how to discover your True Personal Vision. Temenos Vision Lab or TVL is a unique session developed by Temenos+Agility that helps you discover your True Personal Vision. Created based on 25 years of business consultancy experience and psychological insights, TVL is led by some of the best leadership coaches in business. 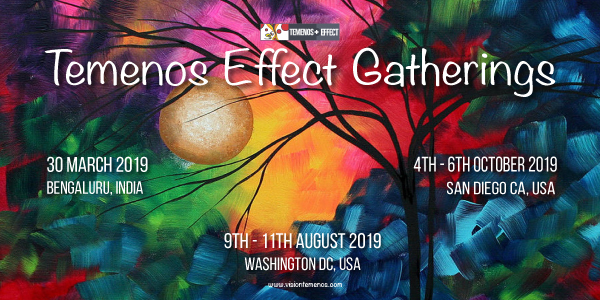 Temenos Effect Gathering 2018 - Bengaluru, India 22nd March 2019.